When meeting clients for the first review of concepts for either an addition or custom house, as an architect, there are still some worries that they might not “get it.” I am confident in our design for each project, but each scheme still is tweaked by the way in which a client might use the space. The Studnicks, Keith and Denise, are great clients, they reacted to what we proposed, but it was too much, both in square feet and financially. We came back with a second plan, and it was a perfect fit for the couple, their three girls, and their dog. 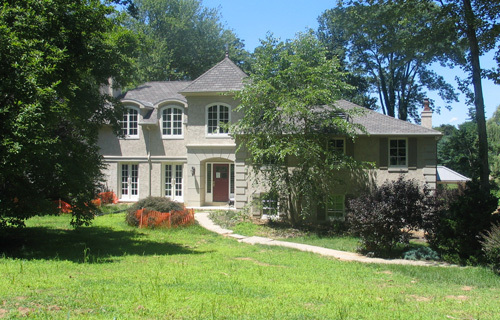 Adapting an existing split level from an under-detailed semi-traditional into a unique split level with European styling would be the challenge of this project. Claiming the space over the single story wing for an entirely new second floor space and Entry tower allowed for the design to transform the façade to something more manageable. With bolder forms and use of simple stucco detailing, the elevations changed in a dynamic fashion. 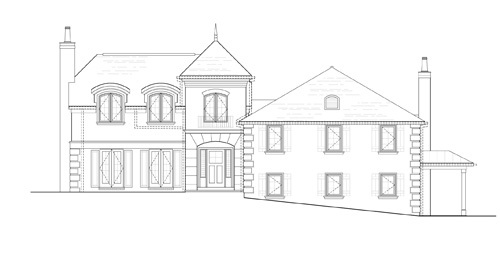 The tower and new dormers allowed the design to pick up on cues from a manor house, a cut stone look, similar to the French Eclectic movement. Hipping the roof also contributed to unifying the two sides of the house, previously there was one side with a gable, the other with a hipped roof. The arched dormers are used on the front façade to vertically connect and stretch the French doors below. 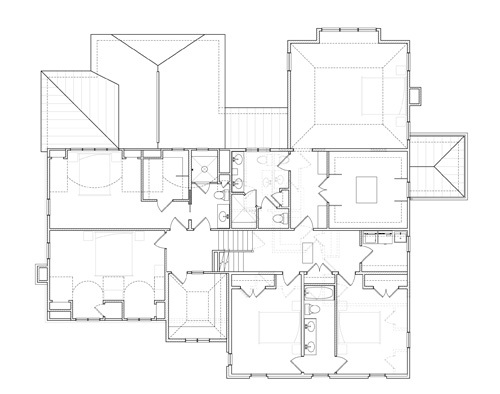 The existing two-story wing was added towards the rear and became the “utility” block of the house, simple and functional, with the majority of the bedroom spaces. New space was added behind this lower existing wing, keeping the same hip roof forms. The existing garages were added to for outdoor toys and tools. A Family Entry is a buffer between the outdoors, where the kids enjoy basketball, and the more finished spaces. This entry still has spaces for the kids to store sports gear and coats for the family. A gallery used as another transition from the lower wing to the higher wing connects the kids’ Playroom with the added Family Room. This transition space proved to be the most challenging spaces, but has a great reward of openness, light, and utility that connects several portions of the house. 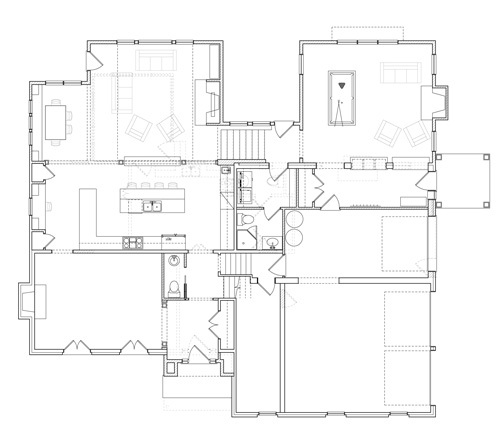 The Family Room is a new space on the upper level exposed to the Kitchen and Breakfast Nook. Keeping the Kitchen under a lower ceiling creates a feeling of warmth and activity, connecting this to the Nook allows for a comfortable space. The Family Room feeds off of both of these spaces, but includes a higher, vaulted ceiling, creating a hub of activity in the house, and views of the new pool and the landscape beyond. Creating a proper window pattern in the existing openings was a design challenge. The window representative, providing shop drawings to ensure that the design was unified, aided the process. Unfortunately, in some projects, this minor detail can undermine the aesthetic of the project. Understanding this family’s use of their home, their desire to remain in the neighborhood, and the number crunching, yielded a very attractive, unique solution. Deceivingly small from the outside, the interior levels continue to provide this family with a fantastic reinvention on their existing mid-century split-level house. This is one project that the challenges improved the articulation of the design.